The MOST EXPENSIVE Joint Supplement is the one that doesn't work! Technyflex® Premium Joint Supplements offer results you can SEE and your horse can FEEL! The Most Expensive Joint Supplement - Is The One That Doesn’t Work! New Zealand's Best knows animals and what it takes to keep them moving as comfortably as possible! When your horse or dog starts to limp, walk stiffly or show signs of joint discomfort, often the first step is a often trip to the vet. But some of the products recommended by well meaning vets either don’t work or are too harsh, causing damage to kidneys or liver over time. You try over the counter products at your local pet store or products you have heard of on TV… as time goes on your horse or dog becomes worse and your hope dissolves with it. The lesson you learn is that the joint supplements that don’t work— are a total waste of your money. But where can you go to get real results that last? We are happy to tell you— about Technyflex® and how it can help restore your horses and dogs to optimal joint comfort and activity! Why Isn’t The Standard Joint Supplement As Effective As Technyflex®? When an animal suffers from joint disease, there can be a variety of factors causing the problem and, as a result, it may take a combination of treatments to help alleviate the symptoms and improve their condition. This can include prescription medicines and holistic approaches, as well as various supplements. Most people are familiar with glucosamine and chondroitin, and they are commonly thought of as the first line of defense in treating joint problems. Some research shows that giving glucosamine and chondroitin together can provide relief for moderate to severe pain, but gives little relief for mild pain. Additional research says that while glucosamine on its own may offer modest pain relief, chondroitin does not lessen osteoarthritis pain. However, Dr. B.E. McKenzie wrote in the Journal of the American Veterinary Medical Association that, Oral administration of glucosamine and chondroitin is often used for prevention and treatment of osteoarthritis in dogs, and there is widespread belief in the safety and efficacy of this practice. However, it is important to base recommendations to clients on the best possible research evidence and not solely on the popularity of a practice or anecdotal reports of positive outcomes…[T]here was insufficient evidence to support a recommendation of glucosamine and chondroitin as an alternative to NSAID medication for treatment of clinical signs attributed to osteoarthritis in dogs…Glucosamine and chondroitin are perhaps the most widely used nutraceuticals for treatment of osteoarthritis in human and veterinary patients. It is worth considering, however, that there is only very weak clinical trial evidence to support this practice and that it is appropriate for veterinarians to temper their recommendations to their clients accordingly. So How Is Technyflex®, Made Of Greenlipped Mussel From New Zealand Waters, Different, and How Can It Help? After trying other options, pet parents and animal owners may often look for other types of joint health supplements. Technyflex®, made from 100% New Zealand Greenlipped Mussel (Perna canaliculus), offers an effective, nutrient rich alternative to other supplements. It naturally contains healthful vitamins A, B2, B3, B6, B12, C, D and E, along with essential minerals boron, calcium, chromium, iodine, iron, manganese, magnesium, potassium, phosphorus, selenium, sodium, sulphur, taurine, and zinc. Technyflex® also offers glycosaminoglycans or GAG’s (primarily in the form of chondroitin sulphate) which attract water and are useful to the body as a lubricant or shock absorber. GAG’s help elastin and collagen (a major component of all bone, tendon, and ligament) stay strong and flexible. GAG's also provide the necessary building blocks to regenerate cartilage and connective tissues, and they help make synovial fluid (which reduces friction in joints during movement) thick and gummy. In addition, Technyflex® has proteoglycans which are proteins that bond to GAG’s and are present in connective tissue. Why Is Greenlipped Mussel Used To Fight Inflammation Naturally? To understand the effectiveness of the New Zealand Greenlipped Mussel, it is helpful to know the history of this little shellfish with the funny name. The Greenlipped Mussel has been enjoyed for centuries as a traditional food of the New Zealand coast dwelling Maori people. Found only in the clean coastal waters of New Zealand, the Greenlipped Mussel hit the radar of NASA scientists in the late 1960’s and early 1970’s during their search for natural cancer-fighting treatments. Researchers conducted a comprehensive search of marine organisms in an attempt to isolate possible natural drugs. While they found no discernible anti-cancer results from the Greenlipped Mussel, the patients in the study who were also suffering from arthritis reported decreased pain and joint stiffness, along with increased mobility. Raw Greenlipped Mussels appeared to have impressive anti-inflammatory properties. The results were groundbreaking, and prompted further study into the possible benefits of the Greenlipped Mussel. Over the next forty years, scientists identified many of the nutrients responsible for this anti-inflammatory effect and confirmed their benefits for joint health - for people, and even for dogs, cats and horses. Important Note To Animal Owners: A research study conducted by the Hawthorne Institute found the Greenlipped Mussel in Technyflex® contained twice the number of fatty acids as shark cartilage or abalone, nearly 40 times the fatty acids in glucosamine and chondroitin, and 60% more than in other brands of Greenlipped Mussel. Perna canaliculus offers EPA, DHA and ALA. These omega-3’s work by preventing the enzymes lipoxygenase and cyclooxygenase from making inflammatory compounds in the body. Are There Unique Inflammation Fighting Omega-3 Essential Fatty Acids In New Zealand Greenlipped Mussels? Yes! Perhaps the most important component of Technyflex® is its omega-3 fatty acids which are well known to have strong inflammation fighting properties. Unlike other sources of omega-3’s, Perna canaliculus also offers a rare essential fatty acid called ETA (eicosatetraenoic acid). It is thought that this particular substance, found only in the New Zealand Greenlipped Mussel, may be the reason why Technyflex® is so effective. ETA takes inflammation fighting to a higher level because in addition to reducing cyclooxygenase production, it also suppresses the formation of arachidonic acid. This is important because arachidonic acid produces more inflammatory compounds (which you definitely don’t want if your animal already has problems stemming from inflammation). Instead the body uses ETA to actually produce more of the healthy omega-3 called EPA. Is It True That Technyflex®’s Unique Content Can Actually Help Discourage Wear and Tear On Joints and Provide Natural Discomfort Relief? While other supplements and pharmaceuticals may be helpful in addressing joint pain, inflammation and disease, Technyflex®’s naturally unique nutritional content can help prevent wear and tear on joints, provide natural pain relief for joints that are already worn or injured, and help regenerate cartilage and reduce friction in joints. The fatty acids in Technyflex® have been shown to have profound anti-inflammatory effects on not only an animal’s joints, but also in conditions such as stomach and bowel inflammation. What Other Health Attributes Do New Zealand Greenlipped Mussels Offer? They also contribute to eye health, brain function, and give coats a healthy sheen. The Greenlipped Mussel in Technyflex® also contains GAG's (glycosaminoglycans and mucopolysaccharides). These are carbohydrates found in the body that help collagen and elastin stay strong and flexible. Collagen is a major component of all bone, tendon, ligaments and collagen, and is a very strong substance. GAG's also provide the necessary building blocks to regenerate cartilage and connective tissues. GAG's help make the synovial fluid in joints thick and gummy to reduce friction in joints during movement. For these reasons the New Zealand Greenlipped Mussel is uniquely effective at helping animals with a variety of joint issues. How Do I Know That The Greenlipped Mussels Used To Make Technyflex® Are Healthy And Natural? The manufacturer of Technyflex® oversees the growing and harvesting of the Greenlipped Mussels, as well as the production of the mussel powder, adhering to the highest levels of quality and purity in every step of the process. The mussels used are non-GMO (not genetically modified). You can be assured that only 100% pure New Zealand Greenlipped mussel meat (with no shells) goes into Technyflex® and that there are no fillers, additives, preservatives, artificial colors or flavors added. Is It True That Technyflex® Comes In Both A Liquid Topical Gel and a Supplement Form For Horses? Yes! This way you can fight joint pain both internally and topically at the source. Starting at only $60 for a 3 week supply, Technyflex® Equine is a natural joint care treatment for horses relieving discomfort due to inflamed joints, arthritis, lameness, and joint injuries. Technyflex® Equine is made from the Greenlipped mussel (Perna canaliculus) that grows only in the pure ocean waters of New Zealand. This little shellfish offers a unique combination of nutrients that have amazing anti-inflammatory properties. In fact, scientific research shows that Technyflex® Equine is significantly more effective at inhibiting inflammation than aspirin, ibuprofen or glucosamine/chondroitin supplements. Technyflex® Equine comes in 4 different sizes ranging from 100 gram to 1 kg. Note: Technyflex® Equine Supplement is used extensively throughout the equestrian and horse racing industries in Australia, New Zealand, Singapore, and Hong Kong. It has also been approved for veterinary use in Australia to treat and alleviate arthritic symptoms. Technyflex® Equine is a natural discomfort reliever that can help alleviate arthritis symptoms and improve joint strength and flexibility. What Technyflex® Products Are Available For Dogs? Technyflex® Canine is a natural joint care treatment for dogs that relieves pain due to inflamed joints, arthritis, lameness, and joint injuries. If your dog has trouble getting up from lying down, seems stiff and is not as playful as they once were, is limping or walking slowly, has trouble jumping or climbing stairs, he or she may have arthritis or joint damage and Technyflex® Canine can help. Technyflex® Canine is made from the Greenlipped mussel (Perna canaliculus) that grows only in the pure ocean waters of New Zealand. This little shellfish has a unique combination of nutrients including omega-3 essential fatty acids, glycosaminoglycans (GAG’s), and naturally occurring minerals and vitamins that together have amazing anti-inflammatory properties… starting at only $39.95 for 80 capsules! Technyflex® Canine is also available in powder form. Don’t Waste Money On Joint Care Products That Don’t Work or Worse … Cause Harm To Your Horse or Dog! 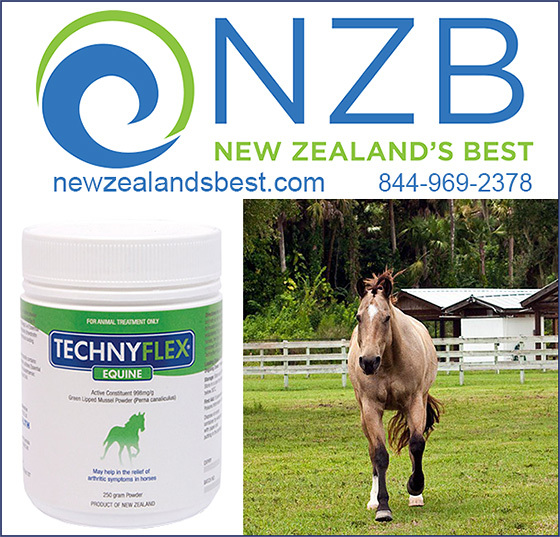 Technyflex® from NewZealandsBest has what it takes to help your horses and dogs to naturally restore their joints to their best possible condition. The Greenlipped Mussel From New Zealand’s Best, also supports, brain, coat, eyes and so much more. You’ll never feel like you wasted your money when you see your animals improve day after day. Call or email us today. Tell us about your animals and let us help you bring back the comfort and health you desire for the animals you love. * Disclaimer: The products and information on these pages are not intended as a substitute for medical or veterinary diagnosis and treatment, but to complement them. If symptoms persist, please seek the advice of a qualified medical practitioner. Products are derived from seafood. Do not use if there is a seafood allergy.